Having read some of HD Gordon her books in the past I was really excited when I heard about this new series of her and jumped at the chance to read and review it. 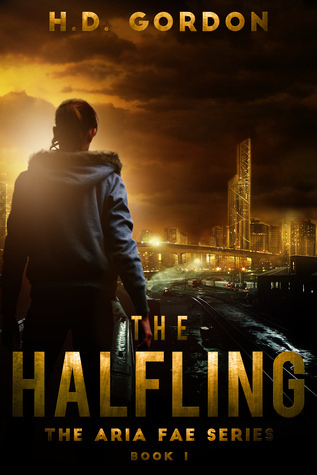 The Halfling is a great book about Aria who’s an outcast, half Fea and half human, she doesn’t belong in the human world where’s she’s stuck. She battles depressing and isn’t at a good point when the moves to Grant City, but I think she finally found her home. She meets Sam and get’s a purpose and immediately things are looking brighter, until things start going wrong again. It’s a bit urban fantasy and a bit superheroes, it has action, cool gadgets, awesome characters and more. The Halfling is a well paced story, that kept my attention the whole time. It’s told in such a way as if the main character is telling her story after everything happened and she hints to bad things that will happen and which decisions contributed to that. It added some suspense to the read and was well done. And once things start going wrong it was hard to put the book. I liked how this book ended, but at the same time feel like it’s only the beginning and I am curious about the next book. Aria is a great characters, she can’t help but care about others and helps them when she can. But she can also be a badass fighter, who fights for good. She struggles with depression and I thought the author handled this well, not go too deep into it to make it truly depressing, but do give a feel for what she’s going through. And even though what’s she’s going through she still tries to be polite and responsible most of the times, even though there are a few scenes where she flips. I loved reading about Aria and her story and seeing how she interacted with other people, like Sam, the flower shop owner and her neighbour. The friendship between Sam and Aria is so awesome and a central part of the book. These two meet each other at the right moment and quickly become great friends, they are there for each other and help each other out. They complement each other and it was great to read about friends like this. Sam is more a nerd or computer geek and the perfect sidekick for Aria. Sam also has been gone through a lot and still struggles with things. I thought she was a great character and a good friend to Aria. There is a hint of romance in the form of two possible love interests, but it’s not really a love triangle. There also isn’t much romance, just a hint of what could be and might grow into more. I preferred her mysterious neighbour to Calem as love interest. The world building isn’t present a lot as this story takes place in the human world. Yes Aria is a half-fea and we learn about what that means for her and her powers and a bit about the peace brokers where she worked before, but we don’t learn a lot about the other world she talks about. There is some cross over with the author her other series, so it might get explained there. Nevertheless I never felt like the world building was lacking, it simply isn’t necessary to know more and would bog down the story. So we learn what’s relevant and the rest stays a bit of a mystery, which worked well. To summarize: I really enjoyed this book, I got sucked into the story from the first page and enjoyed the story. It’s paced really well, with hints of what’s to come and enough plot lines and tension to keep me looking forward to what would happen next. The characters really make this book shine, both Sam and Aria are great characters and we really get a good feel for both of them. I liked how their friendship took much of the center stage and these two where such great friends and I am happy they found each other. There is a hint of two possible love interests for Aria, but this book doesn’t really focus on that. The story fully takes place in the human world, so the world building stays limited. But that’s okay, we learn what’s relevant to Aria, her powers and a bit of her past. And while I am curious to learn more about the other worlds, it’s not relevant in this book and I didn’t feel it was missing. I am pretty sure this book is only the start and I can’t wait to see how the story continues in the next book! Have you read a book with superheroes? This one sounds good. I always find Fae characters to be interesting–even if they are in the modern world–and I’m glad this one kept your attention. Years ago, when I first started reviewing–I read a fairytale romance series where the characters were kind of like superheroes. It was a very interesting series. I know that Sourcebooks Casablanca published it, but I can’t remember the name of the series. The urban setting with the fantasy background and touches made for a fun mix. And I agree Fea characters can be quite interesting. I haven’t read many books with superhero like characters, but I did enjoy that aspect here. It reminds me a bit of the tv series I used to watch as a kid like the Powerpuff girls where they fight the evil with epic powers. I’ve actually never read a book by this author before girl but GOSH the way you described just makes me…. I HAVE LITTLE TINY HEARTS IN MY EYES NOW if that explains to you how excited I am from your review! I’m in love with how the main character is so strong and even though she’s suffering with depression, she still chooses to do good ADN be a good person! WINNNNINNGG! Yes it was a really good book. I think you would enjoy the books by this author. And I really liked how the author handled the main character her depression, showed how hard it was, but also had her continue to do things and be a good person. The characetrs were great in this book. I haven’t seen this one before, and it looks different. I like the sound of the characters, and I appreciate that they take time to form a solid friendship. No love triangles, please. It doesn’t quite feel like a love triangle in this book, more two possible love interest, but not reall a competition or who will she choose part, but I guess we’ll see how it develops in the next book. It was nice that Aria and Sam made such a solid friendschip. It’s not really a love triangle, more like she meets two guys in this books. One hints at romance, the other is a sort of friend, but I get the feel both could be more. But no competition or picking or anything like that, it feels very natural. The romance was pretty muted in this book, but fit the story. Kristen @ Metaphors and Moonlight recently posted…Discussion: Audiobooks, Yea or Nay? I usually don’t like the looking back either, like you mentioned it usually get’s me out of the story, but in this book it really worked and added some suspense. Another series that did that well was the Fever series by Karen Marie Moning, besides that I can’t remember any other books where it was handled that well. And I agree great friendschips like that are rare and it was so well done in this book, I really could feel their friendschip. I usually like a bit of romance in my books, whether it’s a hint or more center stage, I like both. Sarah @ One Curvy Blogger recently posted…Let’s Get Curvy: What is a five star read? It’s a bit sad, but really good too. I didn’t mind the lack of world building as it didn’t fit in this book, the things that were relevant got explained and the rest stayed a bit of a mystery, although I do hope we learn a bit more about the Fea world in the next book too. It was a really good book! As the story took place in the human work the world building wans’t really necessary and would’ve derailed the plot. And I didn’t mean that you learn more about the character because there is less world building, in fact I think both are possible in the same book. It’s just that with how this story is set the world building is less necessary. Cinder is like the perfect example that both are possible! I think Marissa does a great job developing the character through the development of the world being a cyborg and all that as you learn about the world you also learn about Cinder 🙂 I’m in LOVE with that book! I have Cinder on my to-read list, it sounds like a good series. It’s great when a book or series focusses on both character development and world building.